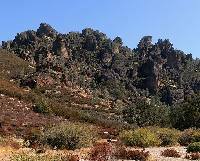 The stunning landscape of Pinnacles National Monument offers visitors the opportunity to enjoy outdoor activities like camping, hiking, rock climbing and birdwatching. The park gets its name from the eroded leftovers of half of an extinct volcano, which form the distinctive spires and crags. Talus caves like the Balconies and Bear Gulch Caves are popular attractions, and can be explored with flashlights. The park's location just off the US 101 highway makes it a convenient stop on any California road trip, offering a few hours active entertainment for families on holiday. Opening times: The east entrance is open 24 hours a day, seven days a week, while the visitor's centre is open between 9:30am-5pm Saturday to Thursday, and stays open until 8pm on Fridays from late-March to early September. Admission: $25 per car, or $12 per person.